sonny bill williams | Who's Playing Who? The home for all your sporting needs! Why is this man here? It will all make sense… once you listen. The podcast returns with the Summer Series for 2012-13! This week on the show, we catch up with all the big stories over our time off. From: Sonny Bill Williams returning to the NRL, Quade Cooper’s possible code switch, Israel Folau, the appointment of the new ARLC CEO and announcement of the 2013 draw, David Beckham’s possible move to the A-League, David Campese’s thoughts on female journalists, and Frank Farina’s return to the A-League with Sydney FC, it’s all covered. There’s all our usual A-League and EPL coverage, a preview of the third Test between Australia and South Africa, Tomo brings us up to speed in the NBA, and we give Skyfall the full review treatment in the Think Tank. Talk about comprehensive… Listen in now! Click here to subscribe through iTunes. Football? Basketball? Professional wrestling? What’s next for SBW? After a five month hiatus, join Adrian, Matt and Tomo as they take a look at all the happenings across the world of sport. 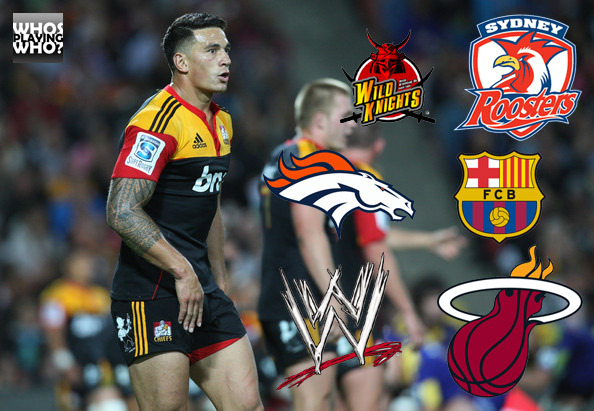 On this episode, the boys discus Sonny Bill Williams and his switch to Japanese rugby/NRL/boxing/whatever else he’s up to, as well as the future of Luke Lewis. Speaking of transfers, the NBA free agency period is in full swing, and the football transfer window is well and truly open in Europe, and both are put under the microscope. There’s all the usual NRL, AFL and Super Rugby coverage, Tomo vents his frustration over handshakes (of all things) in The Rant, plus much more. Enter your email address to subscribe to Who's Playing Who? and receive notifications of new posts by email.